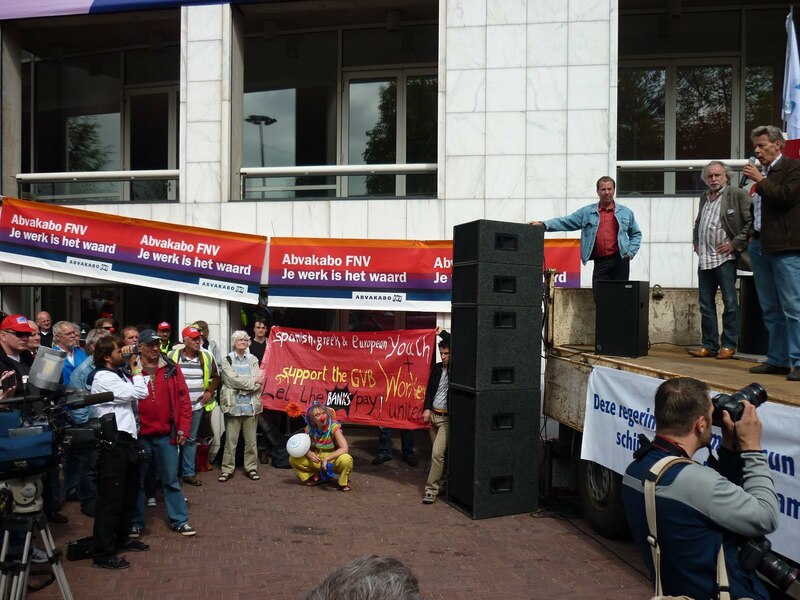 Today some of the Spanish / Greek / 'Dutch Revolution' group (solidarity group from Dam Square) attended the GVB workers' 24 hour strike meeting. It was their third strike against 120 million euros worth of cuts the government is proposing. 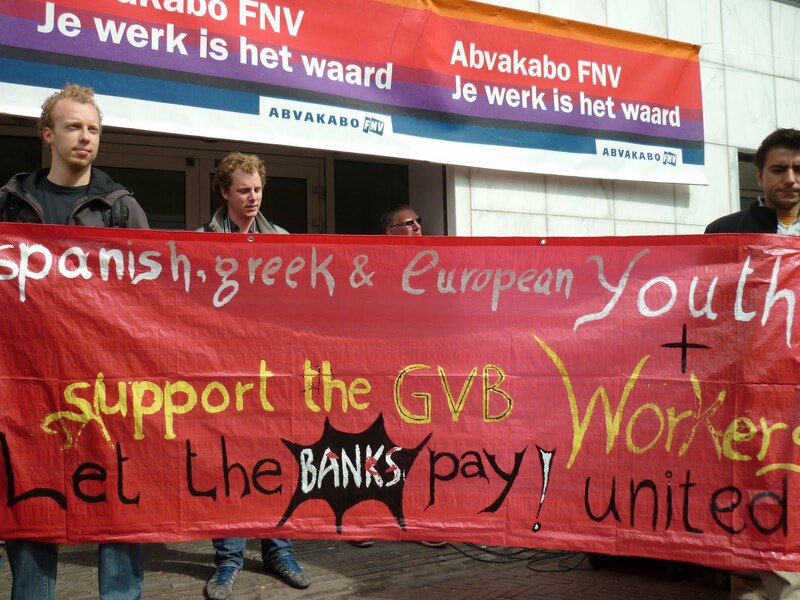 We prepared a banner: "Spanish, Greek and European youth support the GVB workers. Let the banks pay!" (see photo). It was quite prominently next to the stage and cameras. We handed out all 500 hundred leaflets (see attached). An annoucement was made from stage that we were there in solidarity, and the banner was pulled up on stage. See video here. Our aim was to build up the links (in people's conciousness and direct personal links) with the other workers struggling against the same problem - budget cuts and 'savings' to prop up big banks and financiers. That was apparently successful, the responses to our leaflets were, at least for my part, entirely positive. The applause following the announcement that 'Greek, Spanish, other Europeans (and other unions' members)' supported the strike action, received a rousing applause (the video just cuts out the first part that directly refers to us unfortunately, to be rectified). It was a strong first step in the direction of breaking down barriers (incl. 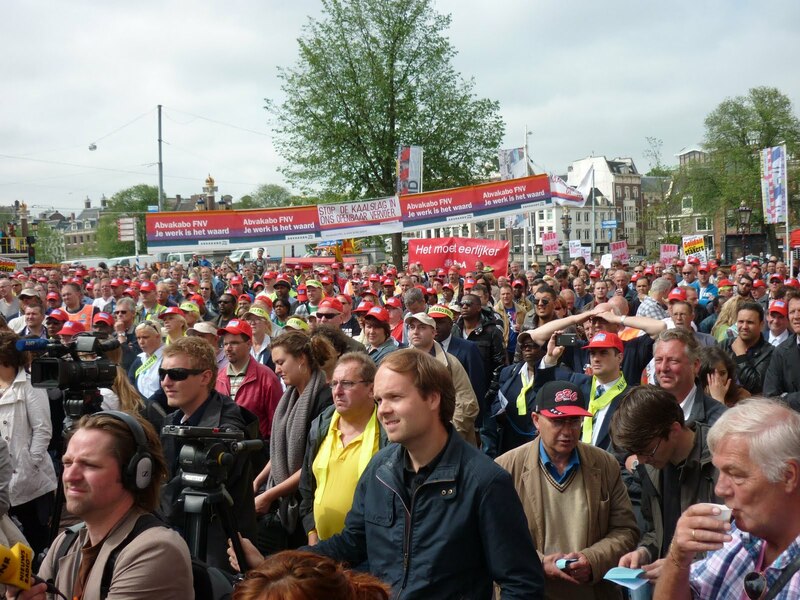 false media stories) between Greek, Spanish, other Europeans and Dutch workers. 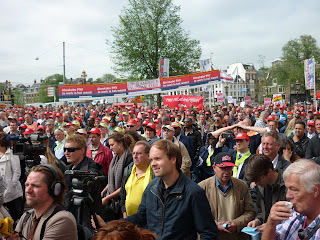 There were at least several thousand workers in attendance. We had low turnout from our Dam group, but those of us who attend gained a very valuable experience. The power of mass collective action was clear. Already there are suggestions from inside the right wing to tone the budget cuts down. Nevertheless, the speakers vowed to keep striking until their demands are met. 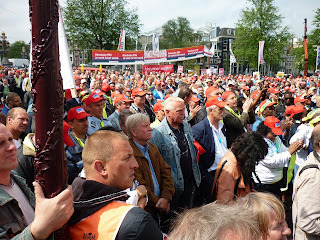 It is always uplifting to see the working class in action, this was no exception.